U.S. Senators (L-R) Amy Klobuchar (D-MN), Claire McCaskill (D-MO) and Mark Warner (D-VA) attend a news conference in Havana February 17, 2015. (Reuters) – The United States and Cuba will hold a second round of talks in Washington nest week aimed at restoring diplomatic relations, the State Department said on Tuesday, as U.S. Democratic senators visiting Havana said there may be enough support among Republicans to lift a trade embargo on Cuba. “The talks will be held on the 27th (of February) here at the State Department,” State Department spokeswoman Jen Psaki told a daily briefing for reporters. The sides held historic negotiations in Havana last month and the next round is seen by U.S. officials as critical to fleshing out details on re-establishing ties. In particular, the United States wants to reopen the U.S. embassy in Havana before Cuba is officially removed from the U.S. list of state sponsors of terrorism. It also wants travel restrictions on U.S. diplomatic staff in Cuba lifted. Cuba made clear in last month’s talks that it first wants to be removed from the terrorism list and wants Washington to halt support for Cuban political dissidents, a step the United States has firmly rejected. The two countries agreed on Dec. 17 to begin the process of restoring ties after more than five decades of hostility. U.S. President Barack Obama has already started to lift barriers to trade and travel. While renewing diplomatic relations could happen quickly, the process to normalize, including removing the U.S. trade embargo, will take far longer. Republican and Democratic senators have introduced two separate bills to lift travel restrictions on Americans going to Cuba and to repeal the 53-year-old embargo. Although both bills face serious opposition in the Republican-controlled Senate and House of Representatives, they do have some Republican support from legislators such as Senator Jeff Flake, lead sponsor of the travel bill. 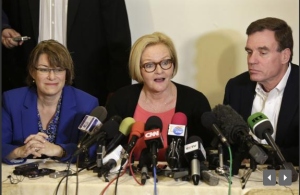 Democratic senators Claire McCaskill, Mark Warner and Amy Klobuchar concluded a four-day visit to Cuba on Tuesday and said they were optimistic about building bipartisan support for an end to the embargo. “So it is the business community and agricultural community who I think might have the most influence on helping us make this effort more bipartisan,” she said. Advocates for ending the embargo need 60 of 100 votes in the Senate and a majority in the House, where there are pockets of strong, mostly Republican opposition to Obama’s new Cuba policy. But McCaskill said opposition to other bills has been overcome when House Speaker John Boehner has allowed the entire House to vote on them. “This could be one of those times, especially if the Chamber of Commerce and the commodities groups and the Farm Bureaus of the world really start putting political pressure on their own party,” McCaskill said. The U.S. Chamber of Commerce has long opposed the U.S. trade embargo as a violation of the principle that government should not impede free enterprise, also a tenet of the Republican Party.